On October 27th, the „Kleine Zeitung“ published a so-called „interview“ with Austrian extreme athlete Felix Baumgartner, who became world-famous for his „Red Bull – Stratos“ skydive. An editor of „Kleine Zeitung“ Steiermark, Klaus Höfler (editor-in-chief „Wirtschaftsmagazin Primus“), adressed Baumgartner with exactly four questions covering a total of 32 words, starting with: „Is a change into politics an option for your future?“. A subset of an answer motivated Mr. Höfler to publish his „finding“ twice. In addition to the original interview, an extra article appeared in the chronicle section of October 28th. Based on Baumgartner’s statement about a „moderate dictatorship“, Austrian media extrapolated this into a desire for Hitler. The media seems to forget the fact that there is a person behind all of this – Mr. Baumgartner. The reactions caused seem to be commonly accepted collateral damage. Critical distance of the journalist Klaus Höfler? To this day (5.11.2012, 18:00) you can read „opinions“ on his Facebook wall like „redbull-schl****“ – which directly translates to „redbull-a**hole“. This is a direct comment under the posting which was proudly made by Mr. Höfler after his 32-words-interview. It served as the first shot in a negative media-campaign aiming to denounce the internationally celebrated extreme athlete Felix Baumgartner. (Image cited from Klaus Höfler, public posting on facebook). The chronicle was titled „Baumgartner Wants Moderate Dictatorship“. „Baumgartner: We Would Need a Moderate Dictatorship“ was the headline of the interview. An intended scandal for the sake of readership? Why does „Kleine Zeitung“, a daily newspaper known for high journalistic quality, operate in a style which we have come to expect from mundane yellow press media? The publication led to what was to be expeced after such headlines: All relevant Austrian media (meanwhile followed by several international media) followed the example of „Kleine Zeitung“ word-for-word. Moreover, so-called „quality media“ usually distinguishing with outstanding political correctness, made up additional details which were perfectly suited to ruin Felix Baumgartners reputation. „A Little Hitler“ would be what Mr. Baumgartner desires – according to Mr. Hans Rauscher from „DerStandard“. These remarks were not made within playful comments, but as headlines. On October 31st, Günter Traxler topped this claim in the same newspaper („DerStandard“ – by the way, Austria’s second largest online newsmedia), headlining „’Super-Felix‘ Baumgartner on Sports and Dictatorship: Where is Room for Hitler?“. Mentioning Hitler always guarantees readership. So does yellow press. Obviously, so-called „quality media“ do not want to surrender this field to the yellow press. But to date, no one has asked the question: Where is legitimate journalism hiding? And then further: What was the real intention of Baumgartner’s statement? Does this statement really justify the dismantling of a potential idol for millions of young people? 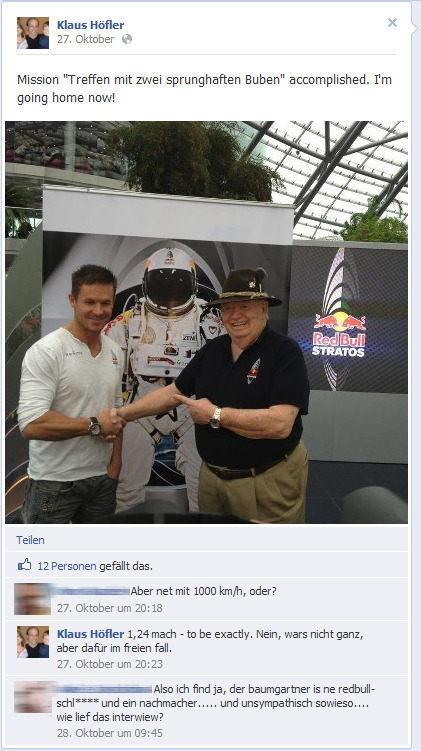 The United Nations intended to appoint Baumgartner as Youth Ambassador for the organziation. Not very surprising, considering that this world has a shortage of peaceful role-models who inspire by reaching their aims through discipline and diligence. But in Austria mediocrity has silently become the ultimate benchmark. Where anyone who would otherwise strive to break out of the middle of the „ordinary people“ to be „something special“ needs to learn the power of the self-righteous journalists collective instead. An austere and highly intrinsically dynamic corrective assures that all heads alike remain where they belong: down. To this end, a space-hero needs to be made a punching bag as fast as possible, as if to ensure that the average Austrian understands: There is nothing there to reach beyond mediocrity. An all-inclusive club holiday in Turkey, taking a walk on the beach between Bibione and Caorle and possibly a trip to the Ballermann on Mallorca must remain the greatest adventures in a person’s life. Anyone who dares to aim higher than this will be slapped. Especially if someone has the nerve not to be perfectly (politically) educated to defy the carnivores of Austrian gutter press. A society driven by envy enables the applause of the audience. Unlike Mr. Klaus Höfler („Kleine Zeitung“, Editor-in-chief „Wirtschaftsmagazin Primus“) I can be blamed not to write for a famous newspaper or journal, but at least I did not forget the basics of legitimate journalism. For example re-checking the original source. Regarding this article, I could do so directly with Mr. Höfler himself. It was perfectly clear to me that I would not get any answers to my questions. But this is not so bad. Because the questions in this didactic play for journalistic proportionality versus greed for readership can stand on their own. … what lead you to conduct an interview with a personality, who was recently honored „bravest man in the world“ by the UN Secretary General, consisting of only four sentences with a total of 32 words? … did you prepare for this interview or were the questions made-up on the spot? In what environment did the interview take place? Written, as a phonecall or in person? Did you authorize the text prior to release? … what do you think is a „moderate dictatorship“? … do you believe that the definition of a „moderate dictatorship“ is so commonly widespread that no further enquiry is necessary for clarification? … regarding your longtime experience as a journalist, could you have foreseen the media’s reaction to your interview? … what quality to content, what new insights did you expect, when you decided to ask the former car mechanic Baumgartner a political question? Are there other car mechanics interviewed on political issues by „Kleine Zeitung“? … what is your opinion of Mr. Rauscher’s („DerStandard“ daily newspaper) allegations concerning „a little Hitler“ based on your interview? … do you believe that Mr. Felix Baumgartner actually wishes for a „little Hitler“ reinstalled, or did he possibly use an awkward expression when attempting to fathom an expert government? … what was the most important thing regarding your publication: the foreseeable immense media attention or the informational content?